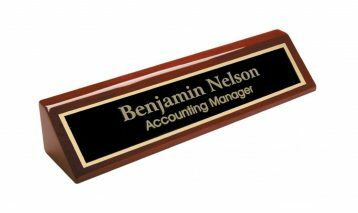 Make an impression, highlight an achievement, honor your employee, give a gift of inspiration or congratulate your friend or family member. 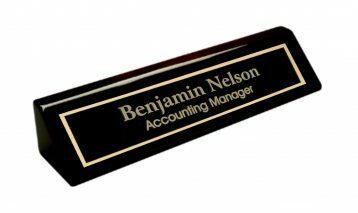 Your name and title or message is laser engraved onto a two tone metal name plate that is adhered to the surface of a Rosewood Desk Wedge, creating a memorable and everlasting impression. 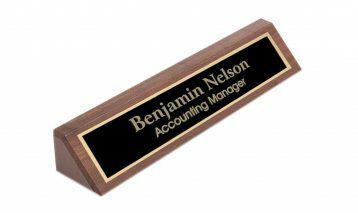 Let us know about any specific details about your order, and we will try and accommodate whenever possible. Would you like to see a proof before manufacturing? If requested, a pdf proof will be sent to the email you provide at checkout within 12 hours of your order. Please watch your e-mail and check your junk email folder and make sure to provide us an email address that can receive an email with attachments. If you do not receive an email within 12 hours please contact us.